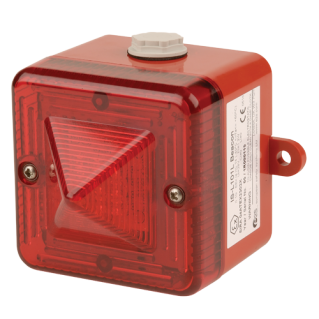 The IS-L101L units are Intrinsically Safe Beacons for field mounting, which provide a bright flashing warning signal. The unit can be used independently or combined with an IS-A105N 49 alarm sounder. Combination units can utilise a common zener barrier or galvanic isolator and may be coupled together or mounted seperately. With the IS-A105N the alarm accept function can be utilised. By closing a pair of external contacts (i.e push switch) the operator may silence the alarm for set periods between 5 seconds and 2 hours. If after the preset time the alarm condition still exists the sounder will activate again. – IECEx EExia IIC T4 Intrinsically Safe, zone 0. – Combines with A105N-IS to form sounder/beacon. – Voltage: 10-28VDC via zener barrier. – Light Source: High Output LED’s. – Flash Rate: Stand alone mode – 120fmp; With IS-A105N – 60fpm (alarm on), 120 fpm (alarm accepted). – Temp Rating (degrees C): -40 to +60. – Cable Entry: 1 x 20mm gland knockouts. – Lens Color: Available in – amber, blue, green, red. Unit may be powered by any certified zener barrier with output parameters not exceeding-Uo: 28VDC Io: 110mA, Po: 0.8W. 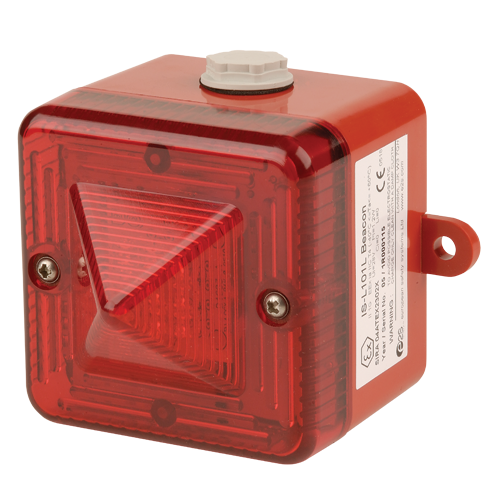 ESS7010ISX IS-L101L beacon, (specify colour). MTL7728 MTL7728 + I/S barrier 28V.